SEARCHENGINE – 2001 | JONAH BRUCKER-COHEN, PH.D. SEARCHENGINE – 2001 – JONAH BRUCKER-COHEN, PH.D. Generate live Internet search terms with a real engine. SearchEngine is a physical search engine interface. By pulling the motor starter cord, search terms are pulled live from the Internet and projected on the wall as a rising cloud of exhaust. SearchEngine is the sixth installment of my Physical Web Interfaces projects. The idea is to fully realize the concept of the search engine by actually connecting the process of starting a real engine with the experience of searching the web. Instead of finding results from a search, this engine produces the terms themselves that are pulled directly from a live source on the web. I wanted to turn the metaphor of “search engine” back onto itself and see what it really meant to use a real engine that conducted searches. 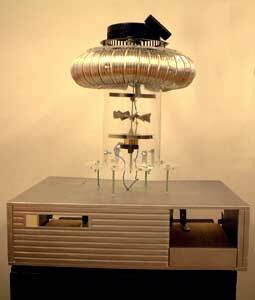 The SearchEngine system consists of a physical installation made of plexi-glass tubes, an old PC computer case, a DC motor, and a PIC16F84A chip that communicates serially with the computer and the motor and reads in the switch information. 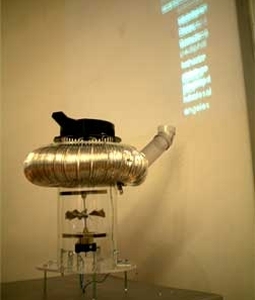 When someone pulls the starter cord, the engine starts spinning and live search terms are pulled from the Metacrawler site and projected on the wall as exhaust along with fake smoke.